The movement is happening. Between Black Lives Matter, the King v. Burwell ruling, or the Supreme court decision inspiring America to be lit up in rainbows, it has been quite a time into the beginning of July. We are now infinitely closer to true equality and peace on this planet, however, we all know, change doesn’t come easy, and it is through using our collective voice and inherent individual power to stand up for what we value. Yes, the future is bright for unions, that is, as Margaret Mead would say, those individuals united and committed to higher goals than themselves. Most inspiring is the overwhelming support to raise the minimum wage across the nation. A nationally local movement, we have seen cities take different stands on what they are committed to doing, with polls showing that 75% of Americans – including 53% of Republicans – supporting raising the national minimum wage to $12.50 by 2020. (1) Recently, home care workers were approved for a $15 minimum in Massachusetts amidst national shortages for our aging populations. Locally, in Los Angeles, a minimum wage hike was approved on May 15, thanks in part from the organizing done by LAANE, RaisetheWage, and other organizations and individuals, who we stand in support with. While this progress is good, we must be committed to fighting for what all workers and citizens deserve. Ingela Dahlgren, Executive Director of SEIU Nurse Alliance of California, spoke at initial hearings before the $15 minimum was approved in Los Angeles and recently attended an Economic Development Committee meeting on the question of Paid Sick Leave. While there was a lot on the agenda, including Batman & Joker who joined the meeting to comment on the sorry state of affairs (more a distraction than anything) there was a huge turn out of support of workers, labor coalitions, and environmental organizations wearing face masks to show their support for workers that have no other choice than to go to work sick. Rosa Lopez was one of those who spoke during public comment sharing how she was forced to work as a cook while she had the stomach flu despite her employer and colleagues knowing that she was sick. It doesn’t take a rocket scientist to recognize the lack of paid sick leave as a public health crises. The public comment was limited to 10 minutes, 5 from each side, so we did not have the chance to share the nurse perspective, of all those individuals who have found themselves in a crises from being overworked and underpaid. However, you may read our public letter of support here. For a low-income family, going just three days without wages is the equivalent to losing a month’s worth of groceries, not to mention the lack of affordable housing, just see this infographic. In contrast, it only costs employers an average of 26 cents an hour to provide paid sick leave. (2) As well, 90% of Los Angeles residents support mandatory paid sick leave. Despite the overwhelming support, the Council postponed voting on this measure until July 21st. No doubt, we will continue to see many changes take place, as unions become more relevant than ever for organizing all to speak up for change against persistent institutions and protocols that are no longer relevant in this new landscape. As we organize around our values, for the health and wellbeing of all, we will see a real positive influence. Feel free to share your thoughts with us on Twitter and Facebook. We use the hashtag #NurseStrong in solidarity. WASHINGTON, D.C.–SEIU International President Mary Kay Henry issued this statement today in response to the decision by the U.S. Supreme Court in King v. Burwell that upholds the availability of tax credits through the Affordable Care Act for eligible Americans in all 50 states to purchase health insurance. “In the last five years, extremist Republicans have tried and failed through two Supreme Court cases and 56 votes to repeal the Affordable Care Act and have no plan for a replacement. Not one man or woman, grandparent or child, has gained healthcare coverage from these efforts. It’s the very law that extremists are trying to do away with–Obamacare– that has increased access to care for millions. “Despite the relentless attacks by extremist Republicans to undermine the Affordable Care Act, there is no denying the law’s success: more Americans have healthcare coverage than at any time on record; individuals can no longer be dropped by an insurance company because of a pre-existing condition such as asthma or high blood pressure; women can no longer be charged more for their coverage; and 137 million women and men are benefiting from preventive care. “After her husband passed away five years ago from a lengthy illness that forced the family into bankruptcy, Claudette Newsome of Houston, Texas, wanted nothing more than to stay healthy for her two young daughters. Thanks to the $385 per month tax credit she receives, she’s been able to afford insurance for her whole family, while continuing to pay student loans from the classes she’s taken to further her career. Now, because of this decision, she can continue to take charge of her health, keeping her healthcare coverage, her scheduled checkups and regular mammograms. 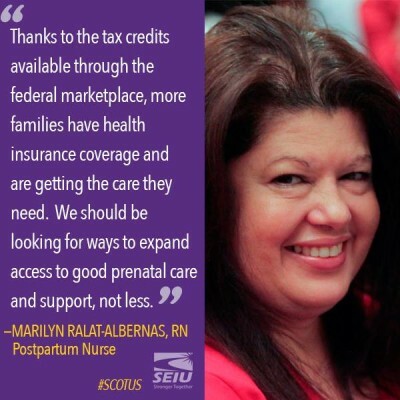 “And for Marilyn Ralat-Albernas, a registered nurse in Florida, the law isn’t about politics. It’s about the noticeable improvements in babies’ health and moms’ readiness to care for their infants because amilies have access to affordable coverage. Women are having regular prenatal exams, ultrasounds to track fetal development, and are becoming better educated about caring for their baby following delivery. “Millions of Americans regardless of political party are benefiting from the Affordable Care Act and it’s time for congressional Republicans to stop trying to take away health and financial peace of mind the law brings to our country’s working families. Call 855-728-5215 right now to tell Republicans in Congress it’s time to stop playing politics. Obamacare is working and it’s time to move forward. Share the good news on Facebook with this graphic. Washington, D.C. – A group of healthcare professionals and SEIU members submitted an amicus brief in King v. Burwell on Wednesday to the U.S. Supreme Court on behalf of working families throughout America. The case under consideration challenges the power of the Internal Revenue Service (IRS) to issue tax credits to millions of working Americans who enroll in private health insurance through the federal healthcare exchange. The tax credits have meant that millions of working women and men in approximately 36 states have gained affordable, quality healthcare under the law and can now see a doctor, afford lifesaving prescription drugs, and be free of the fear of medical bankruptcy. The healthcare professionals are members of the Service Employees International Union (SEIU), America’s largest healthcare union, which joined them in filing the brief. The “friend of the court” brief takes apart the so-called “carrot and stick” premise presented by the petitioners of the court by making it clear that Congress never intended to present a “carrot” to incentivize states, nor a “stick” to penalize Americans in states that did not create and run their own state exchanges. Furthermore, the brief shows this theory is simply a politically motivated fabrication, not supported by the text of the law, by its purpose, by its legislative history, or by the understanding of any state when making the choice whether to create and operate its own state exchange. According to healthcare experts, healthcare coverage for more than 8 million working people hangs in the balance in this case, as well as the risk that healthcare premiums would increase dramatically–by as much as 35 percent–for many more Americans. The court will hear oral arguments in the case March 4 and SEIU nurses, doctors and healthcare workers will be there to share their stories of how the law is improving the health of their patients. December 1st, 2014 marked the day of transition for the LA County Board of Supervisors, the largest governing body of any county in the Nation, and as such a leader in policy. While the previous members Zev Yaroslavsky and Gloria Molina will leave their legacy, the new elects, Sheila Kuehl and Hilda Solis, bring great hope for the new opportunities and challenges facing the county. The new members were sworn in with a series of ceremonies Monday at the County Hall of Administration, with many speakers such as Mayor Garcetti, Labor Leader Dolores Huerta, fellow supervisors, among others. Hilda Solis, who won with 70% of the vote, is representing the first district, covering the eastern part of the county from downtown to Claremont. She served in congress and as Secretary of Labor for the Obama Administration, the first Latina to ever serve the Cabinet. She is a proponent for the rights of women and children and shared a touching story during the ceremony of saving the lives of sweat shop workers from the Phillipines trapped in a factory in the Valley. Sheila Kuehl, with an even closer run against Bobby Shriver, won with 53% of the vote. She will represent the second district, or western part of the county. Kuehl has an excellent track record as a state senator and assemblywoman, authoring the highest number of passing bills out of any other member. She has been a champion for environmental protections, women’s issues, and labor issues. For us nurses, she was instrumental in signing into law nurse-to-patient ratios, which continues to save lives today, and is pushing for enactment for affordable, universal health care. 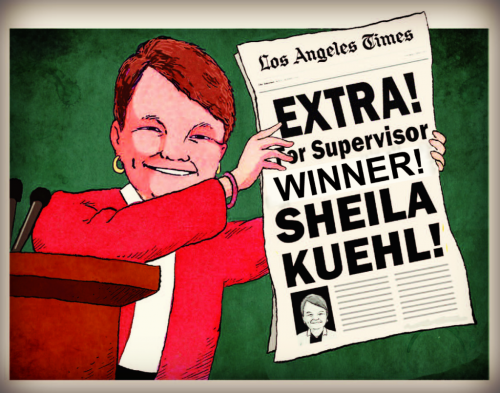 SEIU-backed Sheila Kuehl for the Win! They will tackle a whole range of issues presented by a county with more than 10 million residents and a 2014-15 budget of $27.1 billion. Among their priorities are scaling back incarceration, reviewing a recent decision by the previous board to spend $2 billion building jail, overhauling the child welfare system, boosting minimum pay for workers, and tackling union contracts. 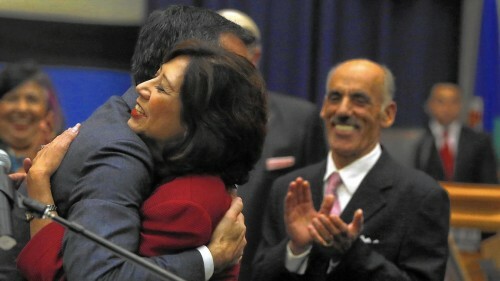 See a video of Hilda Solis’ ceremony here. Watch their first board meeting today at 10:00 p.m. on KLCS. Or see their website for more information.